A White House comedy? Will 1600 Penn find ratings success (like NBC’s West Wing) or will it be cancelled quickly like Animal Practice? Time will tell. 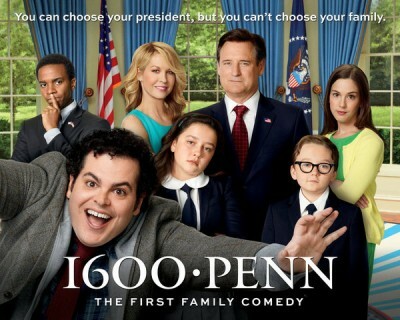 The TV series stars Josh Gad as the goofball son of the President of the United States (Bill Pullman). Others in the cast include Jenna Elfman, Martha MacIsaac, Andre Holland, Amara Miller, and Benjamin Stockham. Below are the TV show’s ratings for the 2012-13 season, the best way to tell if 1600 Penn will be cancelled or renewed for a second season. The show typically airs on Thursday nights. Final season averages: 1.1 rating in the 18-49 demographic with 2.86 million total viewers. 0.7 in the demo (0% change) with 1.91 million (-1% change). Season averages: 1.11 in the demo with 2.86 million. 0.7 in the demo (-22% change) with 1.92 million (-21% change). Season averages: 1.14 in the demo with 2.94 million. 0.9 in the demo (0% change) with 2.32 million (-7% change). Season averages: 1.18 in the demo with 3.03 million. 0.9 in the demo (-10% change) with 2.49 million (+10% change). Season averages: 1.21 in the demo with 3.10 million. 1.0 in the demo (+11% change) with 2.23 million (+6% change). Season averages: 1.24 in the demo with 3.17 million. 0.9 in the demo (0% change) with 2.10 million (-5% change). Season averages: 1.28 in the demo with 3.29 million. 0.9 in the demo (-10% change) with 2.20 million (-6% change). Season averages: 1.33 in the demo with 3.46 million. 1.0 in the demo (-9% change) with 2.34 million (-11% change). Season averages: 1.40 in the demo with 3.67 million. 1.1 in the demo (-15% change) with 2.60 million (-26% change). Season averages: 1.48 in the demo with 3.93 million. 1.3 in the demo (+8% change) with 3.28 million (+7% change). Season averages: 1.58 in the demo with 4.26 million. 1.2 in the demo (-25% change) with 3.04 million (-27% change). Season averages: 1.67 in the demo with 4.59 million. 1.6 in the demo (-27% change) with 3.86 million (-44% change). Season averages: 1.90 in the demo with 5.37 million. 2.2 rating in the 18-49 demographic with 6.88 million total viewers. Season averages: 2.20 in the demo with 6.88 million. It wasn’t a particularly impressive start for 1600 Penn, especially since its lead-in, The Voice, drew a 4.2 demo rating with 13.4 million viewers. Many critics have noted that the later episodes are much better than the first. It remains to be seen if viewers will give the show that much time. What do you think? Do you like the 1600 Penn TV series? Do you think it should be cancelled or renewed for a second season? I really tried to like this show, but it keeps getting worse. Skip is a side character at best, he is not original and is trying too hard to be funny and as a result is failing. Please put this show out of its misery quietly before the Execs at NBC start getting fired publicly. I LOVE 1600 PENN!!! The characters are hilarious! This is not a plot-driven show — it’s all about the characters. I first watched because I love Bill Pullman and Jenna Elfman, but then I fell in love with Skip. And then I realized how marvelous Becca is. I love the performances! Wow. What a terrible terrible waste of time and energy. The writing, the acting just horrible. The critics and viewers really seem to rip on Skip a lot, and yes, his character is annoying as heck, but I know he has talent. This show is not a good vehicle for the actors who have talent. I would say most of the cast have talent, with the exception of Marigold. This girl has all the personality and acting talent of a piece of wood. Knowing that Skip is actually a creator of the show gave me a whole new appreciation.